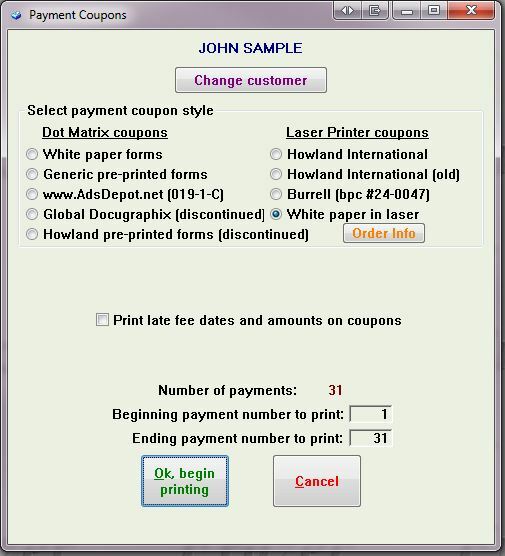 In the main menu, go to Sales >> 2 - Print Payment Coupons. After selecting a customer to print for, specify whether to print a coupon book on plain white paper or generic pre-printed forms. If choosing pre-printed forms, use the option to print a sample to assure that the forms are aligned properly. Print as many samples as necessary before printing the actual coupon book. All coupons will print the customer's name, the dealership information, the payment amount and the due date for each payment. Other Options include printing the late fee date and the amount due if the payment is late.